Graduation Requirements: All SFUSD students must pass two years of physical education (20 credits) in order to receive a SFUSD High School Diploma. Physical Fitness Test administered to students who fail. All students who have 20 credits of PE may continue taking elective physical education courses. Check with your school site counselor or physical education department head to find out what elective physical education courses are offered. Credit recovery opportunity for 11th and 12th graders in need of Course 1 and or Course 2 PE, contact a school counselor for Evening School Application. Evening school is scheduled at Burton HS Tues and Thurs 4:15-6:15. Plan your student's meals out~ When you know what they are going to snack on, and have for your family meals it makes life easier when it comes to sticking to a healthy diet and lifestyle. You will help them avoid temptations, and stop them from grabbing that unhealthy snack. Monitor your student's progress~ Help your student(s) use a Health Journal, to monitor how they are doing, and keep them motivated. Help them write down what they eat, and when they are physically active. This can show your student how they are changing their habits; and changing for a healthier lifestyle. Make it Fun - Have fun with your student, be physically active with them, get outside and play with them, make a game out of it. Japanese Tea Garden - Free before 10am on Mon., Wed., Fri. Check out the Hidden parks of the city, they are magnificent. Find a full list here. But here is a small Preview of the List! Get out and enjoy the city! - Cayuga Playground ~ If you like art this is the park to see! *** For a full schedule please follow the link above, and remember that all movies begin at dusk. Green Tea - this is a healthy drink known to have multiple benefits. Follow this link to learn more. April: Make sure you are taking time for yourself. Take a walk and get some sunshine. Not too much that you get a sunburn, but enough that you get some much needed Vitamin D. Vitamin D is extremely important for your mood, and with the winter we've had we will take all the sun we can get. March: One of the best things you can do in the morning is to stretch! Stretch it out in the morning if you can. It allows you to take a minute and help your body relax before you start your busy day. Try to take a few minutes every morning after you wake up and every evening before bed and stretch your body out. We put our bodies through a lot, even if we don't realize it. Take a moment to treat your muscles right and give them the love they deserve. February: Give your body some extra love by taking your vitamins a natural way. Eat Fruit! Did you know that there a quite a few fruits that have more vitamins than oranges? 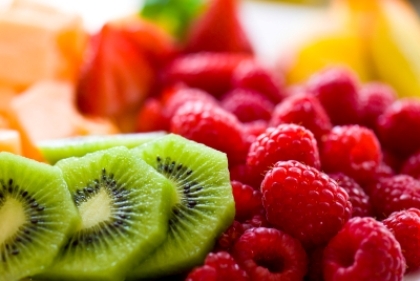 Those fruits include: Strawberries, mangoes, pineapple, and kiwi's among other fruits and vegetables. Give your body some extra love and your mouth a delicious treat with natural sugars, instead of the processed kind. ​January: It is still cold out and we need to stay warm, so try this marinade for those veggies your cooking! Cook your veggies for about a minute and a half of boiling water, then transfer to a pan, and add the marinade below. You can do a mix of veggies or just one type. Whatever you decide! December: December is Here! Holidays are in the air, and winter break is just arround the corner. Make sure you stay warm in the winter with warm cocoa, hot tea or some warm eggnog. Try mixing it up with a chai and egg nog, you can also make a "light" egg nog with some soy milk, almond milk or 2% milk. Have fun with it. It is the holidays afterall. Another fun recipe would be these oatmeal chi cups. Find the recipe here. November: It is a time to enjoy time with friends and family. Holidays should be spent with those you love and enjoy spending time with. As the weather is getting colder now we all enjoy those wonderful warm drinks that keep us warm from the inside out. To keep with the apple theme of the fall try making your own homemade apple cider, follow the link to learn how here. Add them to a "fall salad"
Mix up some arugula, sliced apples, walnuts/ pecans/ sliced almonds(only if you aren't allergic), dried cranberries [another fall treat], and some cheese (goat cheese, blu cheese, feta, or your favorite cheese!) Bam! you now have a wonderfully delicious and HEALTHY salad! If neither of those are your style try homemade apple sauce! Here's how to make it: take 1lb bag of apples, wash and peel them. Place in a pot with water to boil. Add fresh cinnamon sticks to the pot with the apples. Simmer the apples and cinnamon until reasonably soft. You want them soft enough to poke your fork into, but not so soft they are mushy. Once the apples are soft enough, remove from the water leaving the cinnamon behind, and add ground nutmeg, and lemon. If you love cinnamon you can add more ground cinnamon to the mix. You can also optionally add apple cider to the mix. Once everything is added to together, use a potato masher and mash the apples and seasonings together until you have the desired consistency. September: Labor Day is just around the corner and with the heat we get this time of year, make sure you are drinking plenty of water! For every half hour you sweat make sure you drink at least 1 glass of water on top of the water your body naturally needs daily. Take your body weight and divide by 2 that is how many ounces you should drink a day. If you weigh 100 lbs you should be drinking 50 oz of water a day. Remember 1 cup is equal to 8-ounces! Also, make sure you get plenty of vitamins! Cold and flu season is just around the corner, and what better way of getting vitamins than eating fruit! July: Try Apple Cider Vinegar, it helps detox your body, reduces heartburn, and helps maintain your body's alkaline pH level. It is also good for your hair, sunburns, and air freshener. June: Get outside, and Get Moving! We are lucky enough to live in a beautiful city that has plenty of free Gardens, Parks and Picnic Areas. So Get out and enjoy them! San Francisco is CALLING your Name! Even if you don't go to the Park, check out all the fun activities this summer! There's festivals, and street fairs in almost every district in the city. But make sure you get outside and get Moving! May: Have some yogurt, the bacteria in the yogurt is good for your stomach & immune system and it is a good source of protein for the body. For an extra flare add some fruit to the mix or make a whole smoothie out of the deal! Try making your own Pineapple ice cream! April: Cut back on the processed sugar and enjoy the fresh sweetness of the spring fruits finally coming in to the stores. March: Add flax seeds, or chia seeds to get extra nutrients in your diet- you can add them to yogurt, oatmeal, & smoothies. February: Eat Plenty of Carrots, they are filled with natural vitamins that are good for your eyes, skin, and overall health! They even clean your teeth! There rough texture clean your teeth while your eating! January: Make sure you get your vitamin D! Vitamin D can be found in fish, milk, cheese, egg yolks and many other foods. Vitamin D is essential for bone growth, and your overall health! An easy way to get vitamin D is by playing in the sun, sunlight helps your body naturally produce Vitamin D. Just another reason to be active outside!